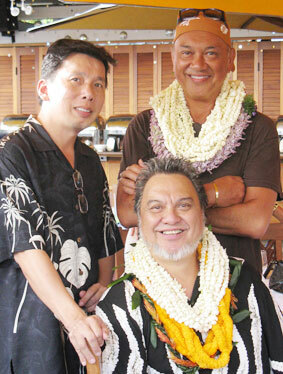 CAZIMEROS CELEBRATE "DESTINY": Chef Chai Chaowasaree, left, and Roland Cazimero, front, wore aloha attire, while Robert Cazimero chose stylish street fashion, as the Cazimeros celebrated the recent release of their album "Destiny" with a pau hana party Friday at Chai's Island Bistro. 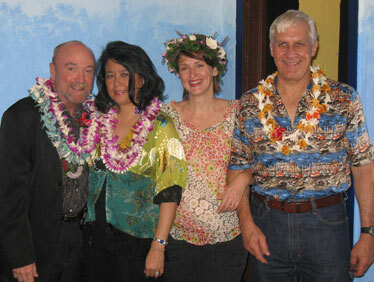 Guests enjoyed a hearty buffet followed by a Cazimero miniconcert. 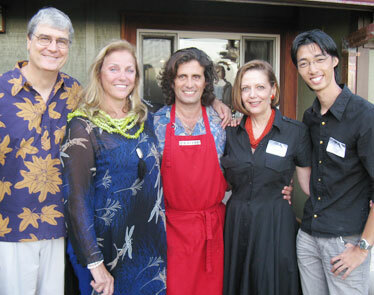 DYNAMIC DOCTOR DOES DOUBLE DUTY: Dr. Michele Carbone, center, was both host and chef at a sunset reception presented by the 2008 Cinema Italiano in Hawai'i Film Festival last Tuesday at his Kahala residence. Carbone had a full spread of Italian delicacies ready when the party started and was still creating wonders several hours after he came out to greet Dwight Damon, left, Princess Dialta Alliata di Montereale, festival director Margherita Balbo Parrent and filmmaker Tommy Chock. 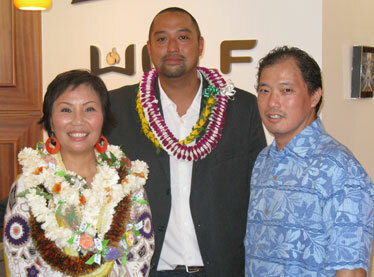 "TABLE SHARING" MADE EASY: Melanie Kosaka and Tony Tung, center, were joined by Kosaka's brother, Lance Kosaka, executive chef at Alan Wong's, as they co-hosted a party introducing "Share Your Table," their Web-based culinary "magazine," Thursday at the Sub-Zero/Wolf showroom. Guests enjoyed an incredible assortment of dishes -- from fresh fruit to Portuguese bean soup. The Italian gelato served by PSG Hawaii's Jeff Taylor was one of the favorites. "REUNION" COMPELLING DRAMA AT TAG: Director David Farmer, left, and his wife, assistant director Loren K.D. Farmer, celebrated with cast members Laura Bach Buzzell and Peter Clark at the opening-night reception for the Actors Group production of "Two One Act Plays" Friday at Yellow Brick Studio. Clark and Buzzell appear in the Farmers' staging of "Reunion," David Mamet's one-act look at family relationships. The show continues through July 13.